FANTASTIC letter, Caitlyn. We’re doing what we can to help, and I will definitely be at the hearing. Hopefully, you can possible find a way to buy his piece of land and show that a farm is profiable there? I had tears in my eyes while reading. What a beautiful tribute to a beautiful piece of land. Thank you for all you have done and continue to do for the land, the neighbors and especially my favorite neighbor Bob. Save the farm! What a beautifully written letter. I cried as I read it. Thank you for the work you do, it is so important. Understanding how water moves across and settles on land is understanding the land. Nicely said, Caitlyn. I will be at the hearing as well. Thank you Caitlyn. I know there are many, many Mission Terrace neighbors who fully support you.We hope our voices will be heard by the powers that be and that they will appropriately support our efforts to prevent this development from happening. Even without the services of a powerful PR firm. May justice prevail. –LCG is not, and never will be, commercially viable. No amount of magical thinking will change that. How are you continuing to fool people that this is true when you have been farming rent-free this whole time? So what is your definition of ‘working farm,’ anyway–is it any farm producing viable goods, whether or not it can sustain itself financially? –Well, then it turns out the City already owns a ‘working farm’ which embodies a ‘public/private partnership’ in some way, shape, or form—it’s called Alemany Farm, less than 1 mile away as the crow flies. –Absent any hope that the City will also someday take over LCG (it will not, ever), a well-intentioned school now owns it and would like to house its students on it with the smallest footprint it can possibly manage. So despite your withering assessment of GBS having ultimately a “private school campus with play area and gardening space,” the real truth is that a very large swath of the property (approximately 75%) will remain unbuilt upon. There is plenty of space for a decent-sized school farm. Why is this portion of the land not worthy of being a ‘farm’ but yours was? –It amazes me how you and your followers fail to mention a large portion of said swath was until very recently covered with thick stands of weedy blackberry vines and fennel (and trash, and concrete chunks, and an astonishing number of liquor bottles) until industrious parents from the school cleared the crap out, paying for City Goats to eat a lot of the fennel, and hacking, digging, pulling, and hauling out the rest of the weeds and trash by hand. –Speaking to the dig on GBS for being a ‘private school’ and your position that public schools are already realizing some sort of vision as being farm schools: Are you serious? I allude to Stephen Colbert-style ‘truthiness’ for a reason: It is simply shameful how you pointedly ignore, for purposes of political gain, your own knowledge of either state-run education (which cannot currently accommodate true farm-based curriculum in the lower grades) or Waldorf education (which can, and does). –And speaking further of ‘truthiness,’ I truly believe you know better than the ill-informed crowd of witch hunters who run Save the Farm. You know the buildings are to be two stories, not ‘multi-story.’ You know this site plan would never stand a chance of getting permitted if it didn’t undergo particularly careful traffic and wastewater engineering. You know the Save the Farm folks re-rendered the architectural drawings in Sketchup or something like that and totally distorted the shape and footprint of the structures. You know those very same neighbors opposed your enterprise and years ago tried to stop your commercial operations. But, who’s counting in the game of politics? Political favor isn’t going to pay your rent, though. I am so disappointed that so many people are against an urban farm, social justice school. The children work so beautifully on the land, growing a variety of vegetables and harvesting them to make soup; they planted a dye garden and carted and dyed their own wool they then spun into yarn and wove a beautiful tapestry, they planted a wide variety of bulbs, and they planted sunflowers and got to harvest the seeds; they get to learn about collecting rain water in order to conserve, how to compost in order to renew. Most of all, they learn to love the greatest mother of us all: Mother Earth. AND it is an affordable Waldorf-inspired school. My parents did everything they could to put me through a Waldorf School and struggled to pay tuition, so it warms my heart that this school, even though it is in the most expensive city in the country, manages to be an affordable school. Shame on the adults who have nothing better to do than bully children and people who are doing something beautiful with their lives. It breaks my heart when I hear the 5-7 year old children talk about how the neighbors hate them and don’t want their school to happen. Think before you act, people. Well School Supporter, well-articulated or not, you sure have a penchant for cognitive dissonance. So what is your definition of ‘school farm,’ anyway? “It is simply shameful how you pointedly ignore, for purposes of political gain…” She said she ADMIRES Waldorf philosophies. How is that ignoring? The main issue, in truthiness, is how to address the idea about disconcerting neighbors not wanting a school to be built on an awkwardly-situated piece of land cause of TRAFFIC, NOISE, PRIVACY. Give credit where’s credit due. Those goats truly did an amazing job clearing that fennel and brambles. It was a sight to behold: those goats and industrious parents. I’m pretty sure ppl don’t hate children, or children growing plants, or mother earth, or their own mothers. But the issue is about the proximity of the school. “Shame on the adults who have nothing better to do than….” Some residence have had their property or have been in their family for DECADES. A 2-story school for 200+ students + staff is gonna affect their livelihood. I don’t have children, but better a school – and a school like this – than condos. You have been gifted the opportunity to steward this land and I am shocked and disappointed by what you say. LCG has been wonderful, and a beautiful community-building addition to this special neighborhood that I love and is my home. But you are not entitled to this property. Land ownership is land ownership. San Francisco real estate is San Francisco real estate. A “private school” of this nature – run by sensitive and thoughtful individuals who are excited to provide alternative educational opportunity not only to SF families, but pointedly inclusive of Southeastern San Francisco neighborhoods (needed!) – is going to touch so many more people in exponential ways than a “private” flower business or local produce for expensive restaurants or a CSA box that only a handful of people are aware of and even this neighbor cannot afford. All while continuing to steward the land for the soil, the birds, the insects, etc. It is a sad day for the LCG project to end, but that was the deal from Day 1 when Brooke and yourself were given permission to steward this land. Kudos to your effort to try and change this land from private to protected. 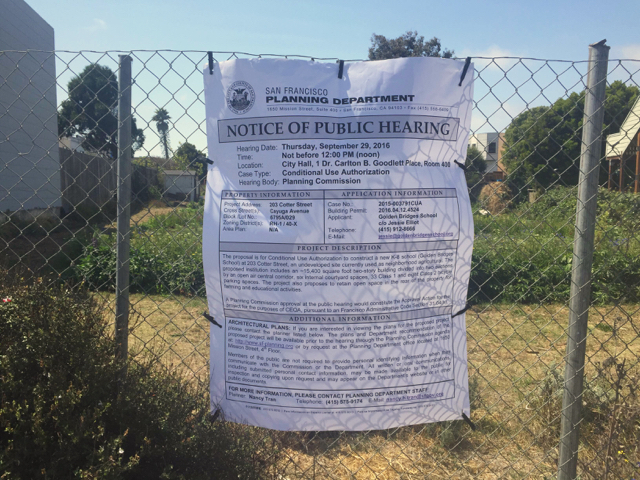 But San Francisco (or another group) is not going to purchase this land for your personal project or even public use. Would neighbors really want a public-use park in their backyard? Golden Bridges School purchasing this oddball piece of land and planning its building and infrastructure systems development in a conscious forward-thinking way in little ol Mission Terrace is a gift – and is absolutely the best thing that could of come of this land sale in this market. This is a hopeful next iteration of this special piece of land in our living, ever-changing neighborhood and city. Entitlement? At what point does initiating dialogue in defense of what you believe become ‘entitlement’? Speaking as a volunteer, I feel many of the supporters of LCG are doing all this because we truly believe that 203 Cotter should remain farmland and not get built up in the manner being proposed. We do honestly believe that what we’re fighting for would be for the common good, not just our sake. I hope we engage in honest and appropriate dialogue and discussion in support of that belief for as long as we can. These anonymous opponents are trying to argue that we feel entitled to farm at this site. In reality, I feel I can say we are all too aware that GBS is the owner/developer and they could potentially evict us. We’ve lived with that reality ever since they eventually made their plans clear. Yet we remained and both farmed for LCG and prepared areas that GBS at times ended up utilizing for their own purposes, all while providing much of the environment for their “farm school” that would not have been there as it was without our backbreaking work. But they paid the former owner for the property, so many feel they were ‘entitled’ to benefit from our work with no compensation to LCG other than a stipend that only helped pay for water that they themselves were also using. So, urban farming is so valuable and important that GBS wants an “urban farm school”, but the actual urban farmer who built the farm they’ve occupied is a self-interested ingrate and a leech for wanting the farm to remain – the same farm that they themselves claim to be preserving as they build over it? Not so. There’s more to it than that. Some of the detractors have at least maintained a respectful tone. That is appreciated, though some of your arguments are riddled with partial truths and misrepresentations that more light will be shed on as this all progresses. It’s important to air all sides of an issue truthfully. That being said, internet trolls who spout vitriolic fallacies and personal degradations while hiding in anonymity are not ‘entitled’ to careful consideration (to be clear, I’m referring to the commentor “School supporter”). Thank you School Supporter for demonstrating how insensitive you are to what’s currently real at 203 Cotter and for also demonstrating how insensitive you have been to the neighborhood and the community that you are trying to become a part of. Insult us all you want, but we stand together to protect what we believe is right. We don’t throw insults or try to demean someone’s livelihood. Will you even care what’s happening at 203 Cotter when your kid is gone and on to the next private school? We will. We are not going away. We are in favor together of Save the Farm! The language and tone being used by school supporters here deeply saddens me. As a neighbor and farm supporter, I’m grateful for the statement Little City Gardens is making here and the recognition of what a truly special piece of land this is. As an educator and parent, I appreciate alternatives in education and the passion that Golden Bridges families are bringing to advocate for their children. But the school supporters here are deriding the community in which they seek to build (“ill-informed witch hunters” who need to be shamed) and belittling the owner of Little City Gardens, who has helped to protect and nurture the very space they claim they’ll be “preserving.” Sure, we disagree on how the land should be developed. Sure, those of us who support the farm are idealistic about the viability of a community-based business. Sure, those of us who live in the neighborhood care deeply about a plot of land whose development will greatly impact the properties surrounding it, and which we believe should not be used for a 200+ student K-8 school. I wanted to write a response thanking Little City Gardens for the profoundly beautiful testament and dedication to this land, and for choosing to participate in the conversation about its use. Instead, I find myself shaking my head at the insensitivity of the school supporters and the ways in which they have chosen to enter this debate. It’s not worth dignifying their attacks with any counter argument here, as their words speak loudly about how narrow-minded they are regarding both community and preservation. And as the Public Educator above said, we are in this for the long-haul, we are not going away, and we won’t be intimidated. If we change this lands zone to no longer be Single Residence & Neighborhood Agricultural. 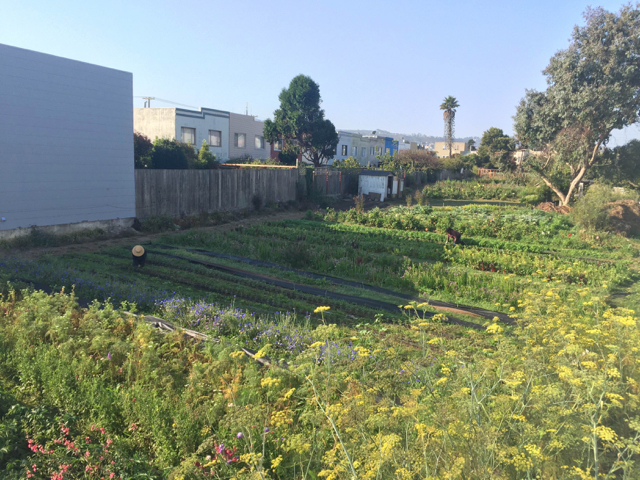 How many Neighborhood Agricultural zones will exist in San Francisco? How many exist now? It’s time to focus on the future of our cities, working together to realize a livable city. If we do not support our urban agriculture we simply will not have it. Please do not underestimate the power of urban farming for the future of our cities, we will never see the impact if we don’t support them now. By saying we already have one city farm shows the huge disconnect between the reality that food security and climate change is not of your concern. If you care about children and education then you should care about urban farming for the future of your children. Cities don’t need to be wastelands for car-choked roads and pavement. Food production in cities make our urban areas more livable and enhances the natural systems that keep us alive and healthy. – Sixty-six percent of us will likely live in urban environments by 2050. – Local and urban agriculture can help reduce greenhouse gas emissions and recycle nutrient-rich food scraps, plant debris and other “wastes. – Urban agriculture provides climate benefits, including reduced emissions from transporting food; carbon sequestration by vegetation and crops; possible reduced energy, resource inputs and waste outputs; and enhanced public interest in protecting green spaces. – Urban agriculture to be positive overall, but concluded support from all levels of government is required to make it viable. – Toronto plans to supply 25 percent of its fruit and vegetable production within city limits by 2025. It’s time for San Francisco to stand up for the environment and support this project! We should be commending the work they have done for our city and not fighting against them. It saddens me that Golden Bridges Schools sought out to buy this land and to change the code at the expense of the farm. It basically goes against a lot of their said core values.